The 'Users' menu in the file menu bar lists the user(s) that are logged-in to system either directly on to the desktop or through remote desktop connection. You can easily switch the user, log-off and communicate with a concurrently logged-in user (either locally or through remote desktop). Click the 'Users' menu from the file menu bar, to view presently logged-in users. Hover the mouse cursor over a user , to open an option menu. Disconnect- Enables you to dissociate a user account from your windows session. 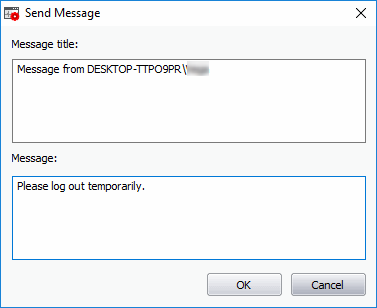 Log off - Forcefully sign out the selected user from your computer. Send Message - Opens a message dialog that enables you to communicate your messages like information, warnings, questions etc. to the selected user. Enter your message in the 'Text' field and click 'OK'. Tip: Press 'Ctrl' + 'Enter' for moving to next line while typing messages with more than one line. Pressing just 'Enter' from your keyboard will immediately send the message. The message will be displayed in the selected user's desktop. 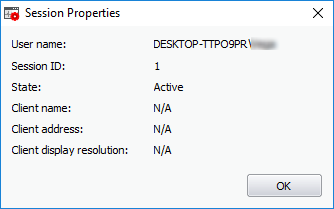 Properties	- Shows the 'Properties' dialog of the selected user, that displays the user's session information.